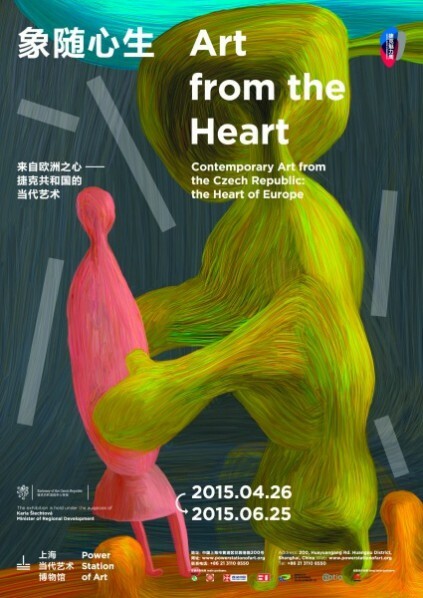 The exhibition “Art from the Heart” featuring contemporary art from the Czech Republic opened on on April 25, 2015, and the exhibition will remain on view till June 2015. The curator of the exhibition is Dr. Miroslav Ambroz. The exhibition is held under the patronage of the Czech Minister for Regional Development, Mrs. Karla Šlechtová, and was opened by the Chairman of the Parliament of the Czech Republic, Mr. Jan Hamáček. The exhibition presents 17 Czech artists, eight of whom are personally attending the opening. Such a large group of Czech artists has not been in China since the mid-1950s. This represents something we can call, with some slight exaggeration, a Czech-Chinese art connection. The coordinator of all the practical issues related to the stay of the artists and to the exhibition is Mr. Martin Hošek, the Czech Embassy’s cultural attaché. The exhibition presents an extraordinary selection of Czech contemporary art, including works by acknowledged masters as well as outstanding works by established artists from the middle and younger generations. The variety of art forms and subject matter gives the entire project a great vibrancy and energy. The central idea and unifying thread connecting all elements of this exhibition is their genuineness and sincerity. The works exhibited here originated from a deep inner feeling, an inner conviction. And that is precisely their power. Courtesy of the artist and Power Station of Art, for further information please visit www.powerstationofart.com.